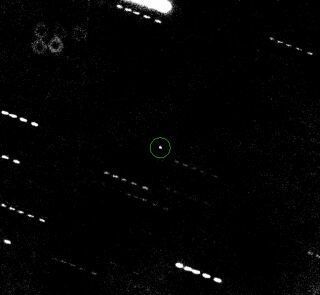 The potentially dangerous asteroid Apophis (circled) is seen here, in a composite of five exposures taken Jan. 31 by a telescope in Hawaii. The doughnut in the upper left corner is an artifact caused by a dust speck on the camera. Astronomers tracking the potentially dangerous asteroid Apophis made a major breakthrough in January, snapping the first pictures of the space rock in more than three years, researchers announced yesterday (March 9). Using a telescope atop the dormant Hawaiian volcano Mauna Kea, astronomers snapped a series of photos on Jan. 31 as Apophis emerged from behind the sun. Of all known space rocks, the 900-foot-wide (270-meter) Apophis is perhaps the one most often cited as a potential candidate for impacting Earth sometime in the next few decades. Apophis became famous in 2004, when it appeared to have a 1-in-37 chance of smashing into Earth in April 2029. Additional data and further analysis, however, eventually revealed that the odds of an impact then are actually much smaller — about 1-in-250,000. While the 2029 encounter poses little threat, it will still be a close shave. On April 13, 2029, Apophis will come closer to our planet than the orbits of many communications satellites, researchers said. It should even be briefly visible to the naked eye as a faint, star-like object streaking through the sky – weather and time of day permitting. The new photos should help them do that. The research team gathered the new images when Apophis was less than 44 degrees from the sun and about a million times fainter than the dimmest star the unaided human eye can pick up, researchers said. "The superb observing conditions that are possible on Mauna Kea made the observations relatively easy," Apophis co-discover David Tholen, an astronomer at the University of Hawaii at Manoa, said in a statement. In addition to the 2029 encounter, Apophis will likely make two other potentially dangerous close passes to Earth later this century, researchers said — though odds of an impact are currently remote in both cases. In April 2036, the asteroid will come within about 18,300 miles (29,450 km) of Earth, with a 1-in-250,000 chance of hitting us. For the 2068 pass, the odds are even smaller — about 1 in 333,000. But more observations are needed to really pin down where Apophis is headed, in case its orbit is disturbed. Astronomers measure the position of an asteroid by comparing it with the known positions of stars that appear in the same image. As a result, any tiny error in the catalog of star positions — due, for example, to the very slow motions of stars around the center of our Milky Way galaxy — can affect measurements of asteroid positions. "We will need to repeat the observation on several different nights using different stars to average out this source of imprecision before we will be able to significantly improve the orbit of Apophis and therefore the details of the 2029 close approach and future impact possibilities," Tholen said. Apophis’ elliptical orbit around the sun will take it back into the sun’s glare this summer, making it tough to acquire additional positions. However, in 2012, Apophis will again become observable for about nine months. And in 2013, the asteroid will pass so close to Earth that scientists will be able to bounce ultraprecise radar signals off its surface, researchers said.